Gift Cards - Buy Now! Robes, slippers and all amenities are provided for your comfort while you use our private facilities which include a whirlpool, treatment rooms, a complete array of snacks and juices and female assistants to assure your every need is met. We request that you leave your valuables at home. 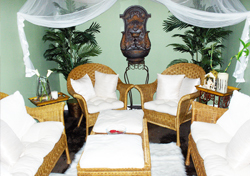 • Guests must be 18 years or older to use the Spa facilities. 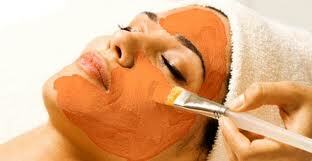 • Spa services are required to be scheduled prior to arrival. • Services may be reserved through credit card or cash deposits. • Gift cards must be presented upon check-in at the Spa. • Please arrive 30 minutes prior to your Spa service. • Late arrivalswill not have the full benefit of their scheduled time. of the total services. No-show appointments will be charged in full. • Gift cards are available for packages or dollar amounts. not available in the first trimester. phones be turned off when arriving at the Spa. Baldness and thinning hair is a very common ailment. Most will suffer from some degree of hair loss. There are treatments and options out there for baldness and hair loss, they vary for men and women. Our on-site Trichology Clinic is the Best Facility for Laser Hair Loss Treatment in the State of Louisiana. With the guidance of our certified specialist we have been successfully treating hair loss in men and women for over 20 years. The FIT® Bodywrap system incorporates a dual action process: far infrared ray (FIR) heat along with our proprietary FIT® Booster Spray to enhance results. Far Infrared Ray (FIR) heat from a FIT® Bodywrap works to get underneath the fat tissue, thinning the blood so that it can get into the areas where fat exists. The FIR technology used in FIT Bodywraps doesn’t make fat leave your body but it breaks the fat down into fatty acids – the same ones used by your muscles to produce energy. Teeth whitening, sometimes known as “bleaching”, is a common dental procedure. According to the FDA, “whitening” restores natural tooth color and “bleaching” whitens beyond the natural color. There are many different ways to do this. Here at BleachBright, we strongly believe that our L.E.D.-accelerated carbamide peroxide trays are the best teeth whitening method. Call 225-927-7085 or 888-273-0043 today to schedule an appointment. All services requires an additional 20% gratuity of the service price.